Head coach Alan Solomons thinks Edinburgh have made great strides since he inherited a "basket case". Friday's convincing 38-20 win over Bordeaux secured passage to the European Challenge Cup quarter-finals as Pool Four winners. "Turning Edinburgh around has been like turning a tanker," a delighted Solomons told BBC Scotland. "It's not been easy but I think we are certainly moving in the right direction." Former South Africa assistant Solomons arrived at Murrayfield in 2013, with Edinburgh finishing eighth in his first Pro12 campaign. "Edinburgh was described by the chief executive of Scottish Rugby [Mark Dodson] as a basket case and I certainly found that," said the 64-year-old. "I've only been here 17 months. I feel we have made progress but at times we've taken a step back, sometimes two steps back. "In the last three months we have had incremental progress and that comes off the back of a lot of hard work. "We've had the vision from the beginning, we've had the strategy. It was a question of implementing it." Edinburgh's good form in Europe has buoyed league displays, with the club winning 10 of their last 14 outings, including an away triumph at Connacht and a 20-8 success against Glasgow that delivered the 1872 Cup. 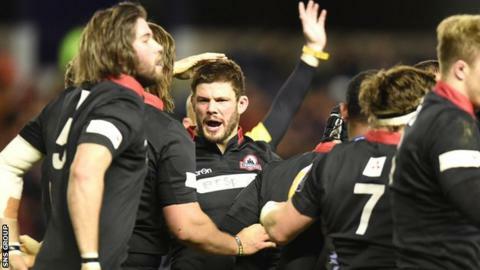 Against Bordeaux, Sam Hidalgo-Clyne amassed 28 of Edinburgh's points in a game where the hosts never trailed. "They sometimes don't travel that well and we thought if we got into them in the first 10-15 minutes that would lay down a marker," explained Solomons, who believes Edinburgh can go further in the tournament. "Once it gets to the knockout stage, it's all about the day in any sport," he added. "There is an element of unpredictability about it and everyone who makes it through has a chance to win the competition."